BEIJING -A Beijing-based anti-smoking group on Thursday said there was no such thing as a safe cigarette and accused some tobacco companies of deceiving consumers. Cigarettes hyped as low in tar and nicotine or laced with traditional Chinese medicine are misleading, if not outright cheating, warned Wu Yiqun, deputy director of the NGO Think Tank Research Center for Health Development at a seminar. China has 350 million smokers, official statistics show. Every year, one million die of smoking-related diseases such as lung cancer. A survey conducted by sohu.com, one of China's major news portals, found that nearly 57 percent of smokers considered cigarettes marketed as low in tar and nicotine as being less harmful. In fact, "as scientific studies worldwide have shown, (they) pose the same health risks to smokers as regular ones," Wu said. China still applies the tar/nicotine measuring standard issued by the US Federal Trade Commission in 1966. However, the commission rescinded the machine-based measurement as it could not provide meaningful data on the amount of tar and nicotine actually inhaled, said Wang Yiqun, an anti-smoking advocate. The flawed testing method is largely used by the domestic tobacco industry to make false statements that their products are low in tar and nicotine, she noted. No smoking in the workplace or public place? "That's unlikely to help consumers make informed decisions," Wu pointed out. 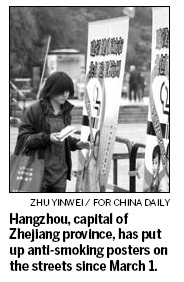 She cited Zhongnanhai cigarettes, made by the Beijing Cigarette Factory. Setting its sights on low tar/nicotine as a future marketing strategy, the factory allegedly invested heavily in techniques like adding traditional Chinese medicines (TCM) and shifting to light-colored and appealing packages, experts said. "They are cheating consumers by cigarette pack design connecting low tar and TCM-laced cigarettes with a healthy, stylish and quality lifestyle," Wu noted. They have also broken the World Health Organization's Framework Convention on Tobacco Control, which specifies that member countries, including China, are obliged to undertake a ban on tobacco advertising, promotion and sponsorship, said Beijing-based lawyer Wang Huiyuan. China signed the framework in 2003, promising to ban tobacco advertising and promotion by 2011. A notice on the Beijing Cigarette Factory's official website said that with changing government policy, cigarette packs should change accordingly to elevate brand image, attract more consumers and make more profits.